The MiG-19 is the first soviet supersonic fighter manufactured in series. He flies for first time in January 5, 1954, and begins its serial produccion in two factories of the USSR, being produced 2,069 MiG-19 until 1957. He was manufactured for license in Czechoslovakia (103 built as Aero S105) and China (4,000 Jian J-6/F-6). 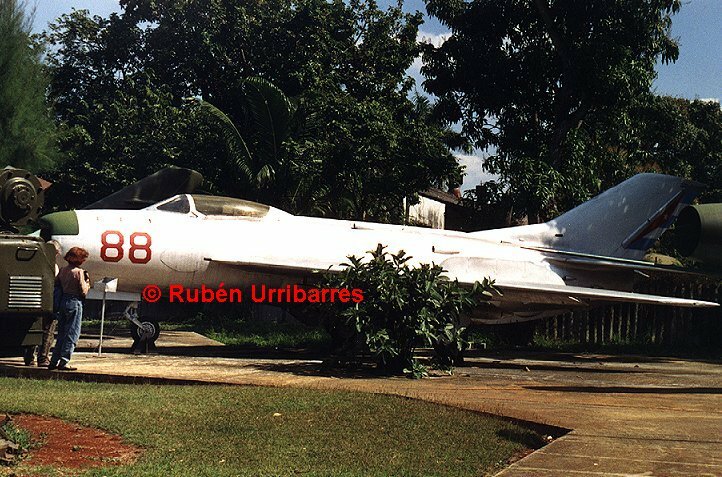 MiG-19P N°88 in the DAAFAR Museum, Havana. The USSR export the MiG-19 to 13 countries. In general the genuine MiG-19 was manufactured in little quantities and few used by the communist block (only 2,5 years in produccion), being the MiG Fighter with more problems and hight level of accidents, passing its users quickly to the MiG-21. Only China achieves to put it ready finally in the Jian F-6, but to lack of somewhat better. The MiG-19/F-6 fight in conflicts of Vietnam (against US, Kampuchea, and China), in Yemen, Arabic - Israeli Wars of 1967 and 1973, Afghanistan, Iran-Iraq, India-Pakistan of 1971, Tanzania-Uganda, Somalia, Sudan. MiG-19P N°82 with aditionals fuel tanks, San Antonio, December of 1961 (Enrique Carreras, Por el dominio del aire) When the FAR reaching certain security in the MiG-15bis, immediately is passed to the MiG-19P. 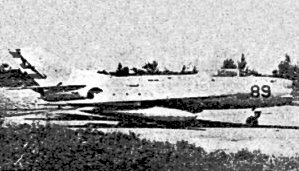 The first 8 MiG-19P arrive in November of 1961 and they finish of being assembled in November and December in the base of San Antonio, with aid of Soviets technicians. In total are received 12 MiG-19P with which is formed an Squadron with pilot graduates in Czechoslovakia and Cuba. The first flight of Cuban in MiG-19P was carried out too by Enrique Carreras on December 1, 1961. In the air parade of January 2, 1962 participate 8 MiG-19. By the Missile Crisis in October of 1962, remained in service 11 MiG-19P, all based in San Antonio in one Squadron. 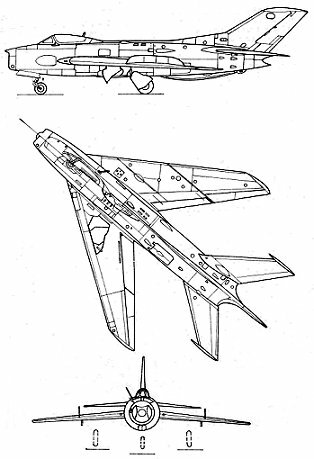 These aircraft participate in interceptions to the American aircrafts (see MiG-15), and in exercises in 1963. The MiG-19P converts the FAR in the first Latin American Air Force with supersonics fighters. At the same time they are the first soviet interceptor with all weather capacity, thanks to its radar. The Cubans MiG-19 are object of several strangers legends in western sources. Like the asseveration of that the Cubans MiG-19 "were used long time in Cuba" or "they are yet in use". 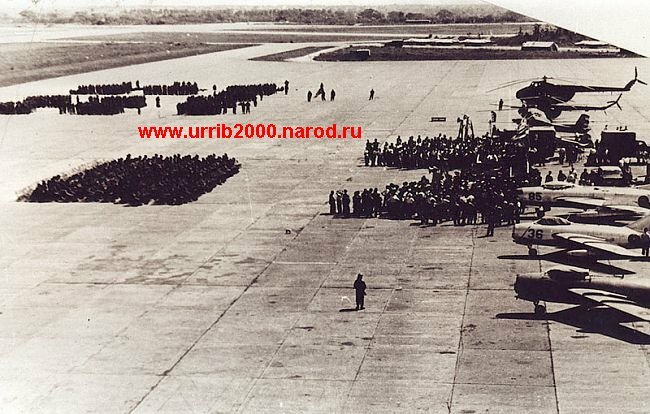 In reality the MiG-19 were the combat aircrafts with more short career in Cuba, of alone 4 years, therefore they are received in November of 1961, and when in 1966 arriving the MiG-21PFM, the MiG-19 are totally retired from the service, passing first to conservation and after total drop. The same thing occurs in other countries of the socialist block, therefore the MiG-19 was a problematic fighter, with numerous accidents, and the very better MiG-21 already was available. In two FAR MiG-19 lost in accidents, lost the life the soviet advisor Ivan Ivanovich and the Cuban pilot Ricardo Cabrera Hernandez. Other legends speak about quantities of 40-65 MiG-19 in Cuba, or about versions PF, PM and SF, all which is not correct. 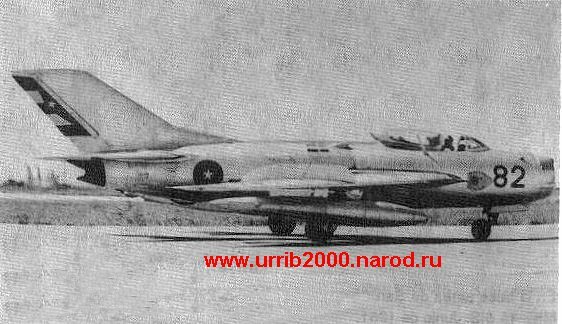 Alone 12 MiG-19 were received in total in 1961, all of the version P. By the Missile Crisis in October of 1962, remained in service 11 MiG-19P, all based in San Antonio in an Squadron. 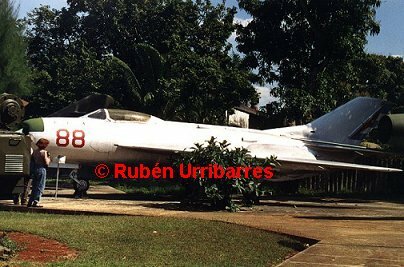 Today remain two MiG-19P exposed in Cuba. One in the Museum of the DAAFAR, and another in the san Antonio Air Base, both with the same original metallic scheme. San Antonio Air Base, April 15, 1963. Ceremony of the DAAFAR Day. The third airplane is the MiG-19P N85, two MiG-15bis are seen too. Courtesy of the soviet pilot Mijail Isaev. 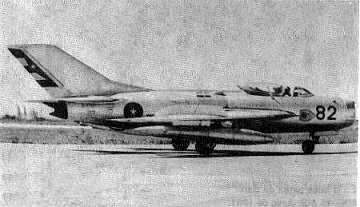 Interceptor version of the basic MiG-19, but with all weather capacity by the radar RP-1, linked to sight, for which the nose was extended 360 mm. The pilot seat was armored, and other improvements. First flight performed August 28, 1954 and since 1955 is incorporated to the armament of the USSR.